Not much gets past my Charlie. He said, “Hey, Mommy – those flowers are not real! See? They’re made of yarn!” I thought it was a fun idea, and I like how it turned out. Rnd 1: Ch 6. Sl st in first ch to form a ring. Ch 1, sc inc in each ch around. (12 sc) Join rnd with a sl st.
Rnd 2: *Sk 1 st, make 5 dc in next st, sl st in next st. Repeat from * around, finish off. Weave in all ends. Roll the end of your pipe cleaner a bit, and poke it through the ring from Round 1. You’re done! 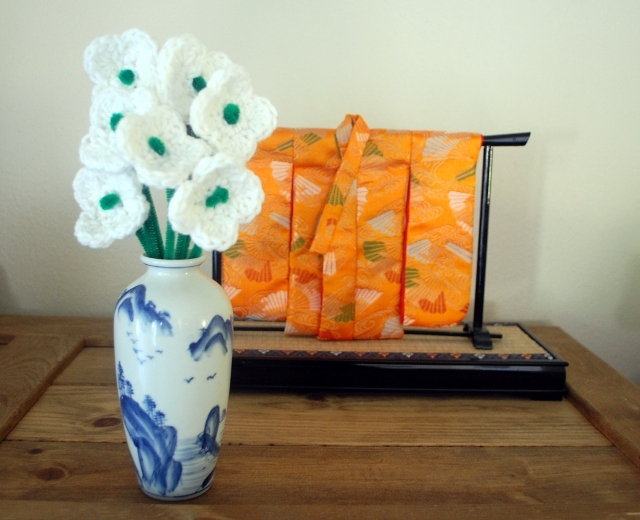 I think it would be fun to use the last few yards of yarn from special skeins to make a flower, and collect the flowers together in a vase. Silk, wool, alpaca, angora and mohair blossoms together in harmony? Beautiful. This entry was posted in Crafting, Finished, Patterns. These flowers are great. 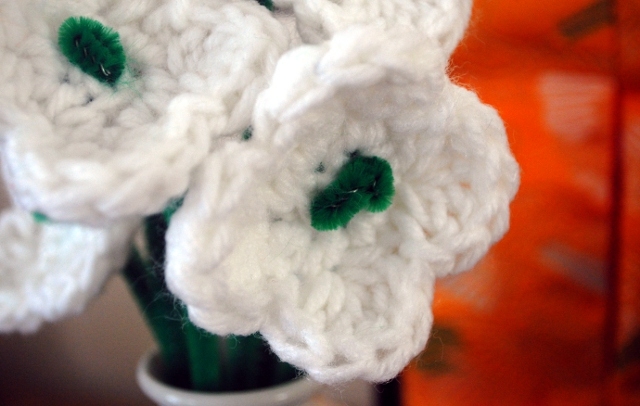 I think that if you used red yarn, with black and green pipe cleaners, it would make them look like poppies!